Financial product comparison site Pocketwise has struck a major distribution deal with NZ media giant, Stuff. Under the revenue-sharing arrangement Pocketwise would split product referral fees with Stuff, which has an audience reach of more than 3 million. Launched in 2017, Pocketwise offers comparisons across a wide range of financial products including KiwiSaver, mortgages, credit cards, term deposits and foreign exchange. The website, which counts Binu Paul and Richard Dellabarca as founders, acts as a referral engine to underlying providers. 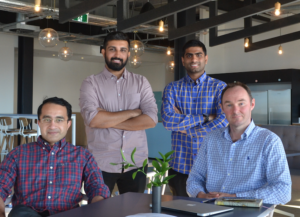 Binu is founder of online KiwiSaver research tool, SavvyKiwi, while Dellabarca heads the NZ Venture Investment Fund and is also director of peer-to-peer lender, Harmoney. For various reasons, some smaller companies prefer not to list their products via comparison sites, Pocketwise says. Paul said the group also has ambitions to list managed funds on Pocketwise. He said KiwiSaver was the most popular section on Pocketwise followed, somewhat surprisingly, by foreign exchange deals. The Stuff deal would significantly broaden the reach of the comparison website, Paul said, that to date has relied primarily on word-of-mouth to grow. If the Stuff tie-up proves popular, Pocketwise would also be able to grow its product range and service capabilities, Paul said. “For example, we’re looking at using analytics,” he said. While there are a number of NZ financial product comparison sites they tend to be sector specific rather than whole of market. However, in the UK, for example, websites such as MoneySavingsExpert and MoneySuperMarket wield huge influence among consumers. Stuff, the entity formerly known as Fairfax NZ, is currently entering the final phases of a sale process kicked off last year when new Fairfax owner, Nine, opted to flick off the Kiwi media assets. Macquarie is advising on the Stuff sale. In other fintech news this week, health insurer Southern Cross has set loose a new ‘digital human’ using artificial intelligence technology powered by NZ firm FaceMe. Southern Cross chief, Nick Astwick, said in a statement that the as-yet nameless adviser-bot was likely a world-first for the health insurance industry. “A digital human can answer questions often asked about health insurance, such as how the New Zealand health system works, what health insurance can cover you for and education around pre-existing conditions. People can feel embarrassed asking basic questions, but the digital human is always patient and doesn’t judge,” Astwick said.